This series of letterboxes was created for and by my math students at Kettle Moraine Lutheran High School. Stealing an idea from the "Pokeyman" series around St. Louis, each of the Mathman boxes has two stamps: a Mathman stamp and a stamp representing the area it is hidden in. Letterboxers are welcome to find these boxes if they're up to the challenge! Feel free to email me at tkuehlTAKEOUT@wi.rr.com with any math questions, or if you want me to check your answers! Remember that many letterboxes are mentally challenging, so please at least try the problems before asking for help! ; - ) The math teacher in me will only allow me to give the answer keys in response to an attempt at the math. 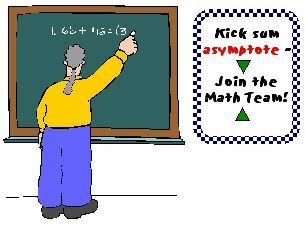 Also, look for some links to sites that may help you with the math. Students and parents of students should read my introduction to letterboxing before seeking the boxes. Note: KMLHS students (and future students) should NOT find these boxes until instructed to do so by a teacher (or until you graduate). Please check the status of these boxes on the LBNA page before attempting them. Before you set out read the waiver of responsibility and disclaimer.